On this first day of the Salone del Mobile at the fairgrounds, the first thing I went to visit was the Salone Satellite, featuring young designers. 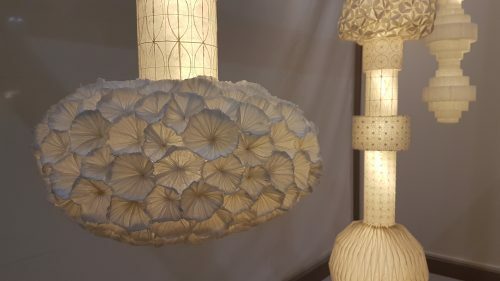 Over the last 10+ years at the show, I’ve seen Salone Satellite grow into a bigger, more professional setting yet continuing to provide young designers a forum to showcase their talent. “Washi” is a Japanese-style paper made from the bark of the branches of the mulberry tree. There have been different design products made from Washi; however, this has been taken to the next level with modular parts. You can simply screw new parts on to make your own pendant light, or remove parts and make a bedside or table lamp. 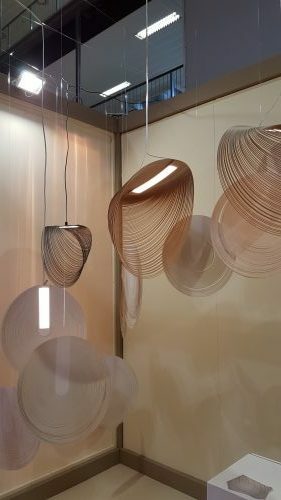 Using laser-cut paper, Ms Horvath created three-dimensional lamps of various sizes which are art pieces in themselves. With a single touch of the lamp, the lamp seems to come to life. It is very difficult to explain, but the photo should give you an idea.